"This recipe is a family summer tradition. Refreshing! You may also add onions if you desire." 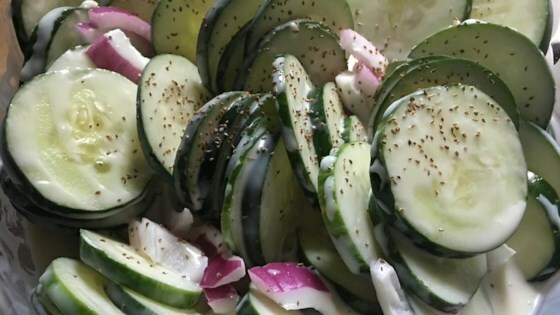 Stir mayonnaise, vinegar, sugar, and salt together in a large bowl until smooth; fold sliced cucumbers into the mayonnaise mixture. Cover bowl with plastic wrap and refrigerate at least 2 hours. Serve chilled. Very refreshing. I did add some onions to the cucumbers. I make mine just like this but add a tsp or two of dill weed. Very good! I added onions too because that's the way I'm used to having them. The dressing was just right.